Senator Elizabeth Warren gained national notoriety during her tenure on the commission to study the financial crisis, leading to creation of the consumer finance agency she headed briefly. In this engaging memoir, she recalls her journey from a childhood of struggle in Oklahoma City to success in academia and politics and laments the lack of chances for others to work hard and achieve their own versions of success. Warren recalls an early marriage, struggling to raise young children as she moved from a career as a teacher to law school to teaching law. She was so agitated by the unfairness of bankruptcy law that she wrote books about it and used her professorship at Harvard as a platform, eventually launching herself into a career in Washington. Armed with stories and statistics about how bankruptcy and predatory banking practices affected middle-class families, Warren lobbied hard for change. She offers a behind-the-scenes look at the political deal-making and head-butting machinations in efforts to restore the nation’s financial system after the mortgage debacle. 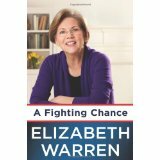 Warren recalls negotiations with political figures from Senator Ted Kennedy to President Obama as well as her hard-fought campaign to unseat Scott Brown as U.S. senator from Massachusetts. This is a passionate memoir of one woman’s personal story and the larger story of corruption in financial circles and the need for reform that balances the interests of the American middle class against those of the corporate sector.